The Irish Gaelic words for whiskey are Uisce Beatha – the water of life. In truth, it no doubt has been the ruin of many a man, rather than life enhancing. But that’s another story from a land which loves stories. Ireland has a rich heritage in whiskey production – it was once the most popular spirit in the world, but this sadly declined in the late 19th Century, and the momentum swung to Scottish whisky through the 20th Century. But exciting things are happening in Irish whiskey right now, and it is seeing very fast growth again. One of the most amazing growth areas is the expansion from just the big 3 distilleries from about 1990 – to now over 18, with a further 16 or so in the planning stages. The Irish Whiskey Association has forecast that between 2010 and 2025 over €1 billion will be invested in distillery projects across the island. Now that’s just phenomenal. I’m from Donegal – a county in the most far flung North West. A beautiful, vast, rugged and diverse landscape and seascape which is relatively unexplored for many. Donegal has a very interesting history in whiskey spirits. In Donegal’s Inishowen peninsula alone, for example, there were estimated to be at least 800 illegal stills running in the 19th century, producing a whiskey which was renowned for its peatiness [IrishSpirit.com]. 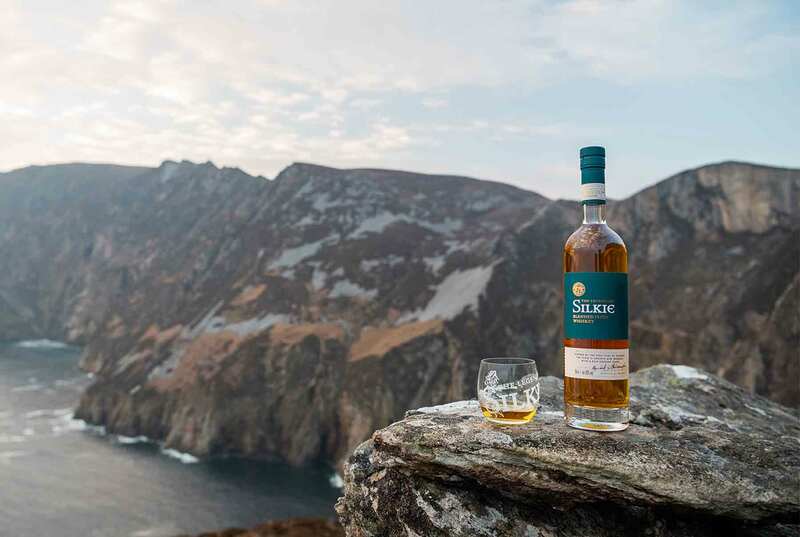 The Sliabh Liag Distillery will be perched among the stunning sea cliffs of Sliabh Liag (or Slieve League) in the Irish speaking ‘Gaeltacht’ and is in the planning stage – this will be the first distillery in Donegal for 175 years. It’s hoped to be up and running c. 2020. “The Sliabh Liag Whiskey Distillery will make Irish whiskey in both Single Malt and iconic Pot Still variants, highly differentiated and reflecting the authentic style in which Donegal whiskey was made in the 19th century. Triple distilled, rich, smoky and peated, the whiskies share in the folk lore of the Donegal Gaeltacht and will be steeped in the often illicit heritage of distilling on the Sliabh Liag peninsula”. What excites me is this Distillery appears to be creating something special – creating a rich set of brand stories to rival the very best of the famous Scottish brands – and uniquely set in Donegal. Have a look at the website. Some lovely collaborative creative work with S Hilton Design in Swindon, including stunning location photography. Have a read at the background stories from where the new whiskey brands are being developed.